Europa Update 2, June 2017 : NASA has recently begun seeking proposals for experiments that will be carried on a proposed mission to Jupiter’s moon Europa. 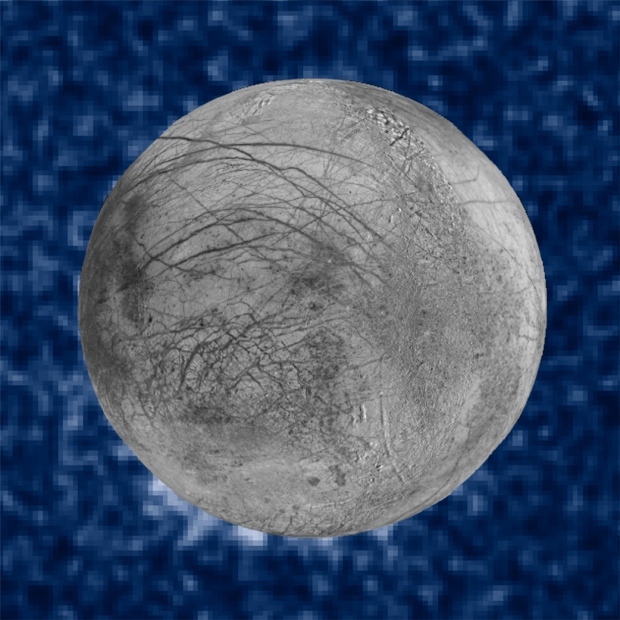 As outlined in an earlier blog (reproduced below), Europa is considered to be one of the best targets in the search for life, in our solar system. That’s due to the vast ocean that is assumed to exist under the layer of ice that exists on the surface (and, from which that surface is composed). According to a BBC report, the pair of proposed missions has now secured support in Congress – it isn’t clear if that is actual money or goodwill, from the article, though. At any rate, there is funding to begin the search for ideas about experiments and how to develop the instrumentation for those experiments. The first objective, of course, is to actually place a lander on the surface of Europa and start looking and digging. Eventually, some sort of mission to the subsurface ocean would be the ultimate goal, though that might take some time. At the moment, we don’t even know how thick that ice is, or whether the ocean comes close to the surface at some points. However, since there does seem to be water plumes coming from below, as well as chaotic regions of ice on the surface, it seems clear the ocean must “outcrop” on the surface at some times and places. The call-out for ideas has been made. Science teams are asked to put together proposals, which will then be evaluated and will move on to a next step, for more detailed work. About ten ideas are assumed to go forward. Basically, NASA wants to land a craft on Europa, that would first hunt for signs of microbial life on the surface. It would use the “sky crane” idea, which was used for the landing of the rover “Curiosity” on Mars. That was a fairly incredible, and quite harrowing feat. One can only imagine that landing on a much colder, more distant world will be even more challenging (and exciting). The lander will carry various cutting tools, in order to break up surface. A motorized rasp was used by a previous lander, again on Mars. That idea will also be used on Europa, though my understanding is that ice at the temperatures that one would find on Europa is very hard stuff, not much different than steel. But, perhaps the top-most layer of ice will be more workable, as it has been exposed to the radiation bombardment created by Jupiter’s intense magnetic field interacting with the solar wind, as well as micrometeorites. 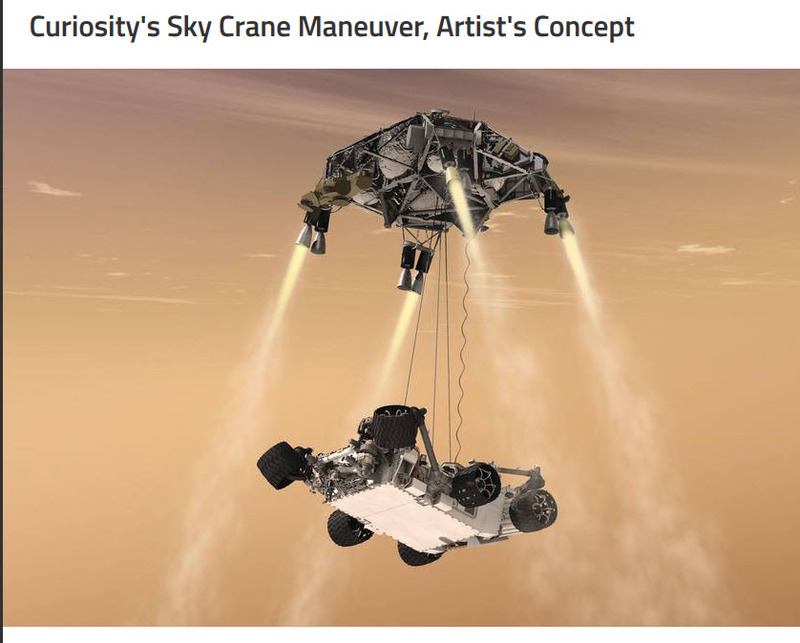 NASA also proposes using a counter-rotating saw. Apparently that is a saw with two blades, spinning in opposite directions, which helps to eliminate the “kickback” and binding that can happen while cutting hard material (as anyone who has hit a really solid knothole while cutting through wood with a power saw can attest). A seismometer is also likely to be included – that would help to define the properties of the sub-surface, such as how deep the ice is, before the ocean begins, and whether there are “lakes” within the ice, that help to channel water to the surface. Naturally, that device will have to be miniaturized and designed in such a way that human intervention isn’t needed to place it nicely on a flat surface. Though the ultimate source of life is likely to be deep below the ice, in the sub-surface ocean, NASA hopes that evidence for life might be found on the surface. Traces of life could have been upwelled from below (as indicated by the chaotic regions of ice) or carried by water plumes high above the planet, to fall back to the surface. Ideally, that evidence would be microbial cells or cell fragments, though traces of chemicals that are associated with bio-chemistry might also be very persuasive. Unfortunately, this mission is still a decade or more in the future. A flyby of Europa, currently called “Europa Clipper” is supposed to launch in the early 2020’s, so that will have to suffice until then. Europa Update 1, Dec 2016 : The Hubble Telescope took some photos of Europa, that have just been released in Sept 2016. These appear to show water plumes, emanating from the moon, to a height of about 200 km. 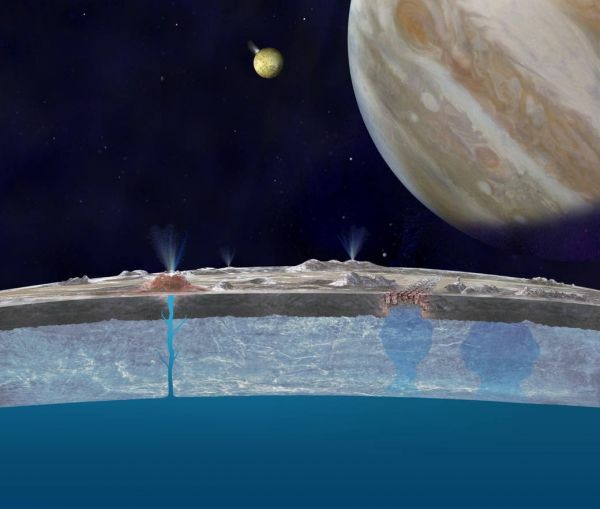 So, that seems to clinch the "water under the ice of Europa" hypothesis. Plus, it implies that the water is not all that deep below the surface, and that it could be sampled by a probe, to see if chemicals that support life are found in the plume. So, exciting times for deep space science. Note: the water plumes have been show below, after much data processing by the discoverers, to isolate and highlight them from the background (e.g. look at the "south pole" area). 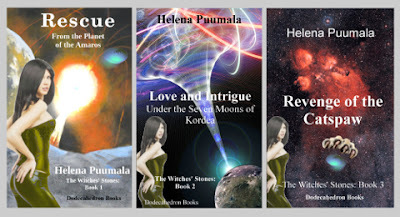 Helena Puumala’s SF Romance series features a planet with seven moons. This rather unusual setting gives me the opportunity to talk about some of the remarkable moons in our solar system, as I test different moons for the cover of book 2 of the series. But, more on that at the end of the blog. Basically, the book gives me the opportunity to do a mini-tour of some of the major moons of our solar system. This blog is about Europa, one of the four large moons of Jupiter, and one of the most interesting, as there is intense speculation that it could harbor life in its deep ocean. It's the smallest of Jupiter’s four Galilean moons, but still the sixth largest in the solar system. As noted above, it is one of the four original moons discovered by Galileo in 1610 (thus, referred to a Galilean moon). It is the second farthest from Jupiter of the four Galilean moons. It is easy to find in a small telescope. It participates in a 1:2:4 orbital resonance with the two Galilean moons that it is between, Io (closest to Jupiter) and Ganymede(third from Jupiter). That means, for every one time Ganymede goes around Jupiter, Europa goes around twice and Io goes around four times. 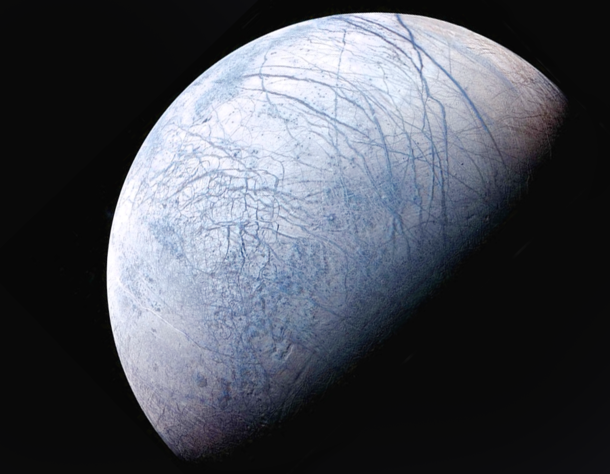 Europa’s orbit takes about three and a half days. It is tidally locked with Jupiter (its rotation rate is the same as its orbit rate), so at a certain point on Europa, Jupiter would always be directly overhead. The orbit is slightly eccentric (non-circular), so sometimes it is a little farther from Jupiter and sometimes it is a little closer. This causes the planet’s shape to change slightly, elongating when closest to Jupiter and becoming more spherical when farther away. The flexing of the planet creates heat (friction, basically), which keeps the liquid ocean under the ice from freezing. The orbital resonance with Io “pumps” its orbit, so that it remains elliptical and does not completely circularize over time. Thus, the moon continues flexing every 3.5 days, supplying a constant source of heat for the buried ocean. An ocean exists many kilometers underneath Europa’s icy crust, which acts as an insulating blanket. Due to the temperature at the surface (-160 Celsius) that surface ice would be as hard as granite. Some researchers think certain “chaotic” surface features indicate that this ocean may occasionally break through in places to the surface. This is an area of intense debate. Europa has a small magnetic moment, probably caused by the salty subsurface ocean, which can act a conductor, and induces the magnetic field. Water vapor plumes have been spotted by the Hubble Space Telescope. It is not known exactly how far down the liquid ocean is, but speculations range from a few kilometers to tens of kilometers. Life could cluster around features equivalent to the “black smokers” of Earth’s oceans, where heat and matter from the crust and mantle below escape into the ocean. Europa might have similar hydrothermal vents. Alternatively, primitive life, like bacterial mats on Earth, might exist near the bottom of this ocean, which would be warmer than the higher levels. There may even be a relatively high oxygen content in this ocean, due to the breakdown of hydrogen peroxide, which seems to exist on the surface. This could then be absorbed into the ocean below. Free oxygen might also come from water ice being broken down at the surface of Europa, by cosmic rays, that is then absorbed into the deep ocean. A high oxygen content could mean complex life (fish?). Its albedo is about 64% (about 64% of the light falling on it is reflected). This is one of the highest albedos in the solar system. The surface is smooth and bright, due to the constant reworking of it by the tidal energies noted above. 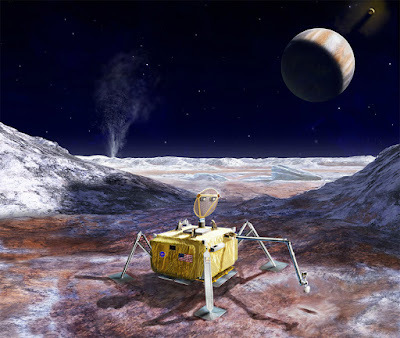 There are plans to land a probe on Europa and drill into the surface. That would be difficult and expensive; among other things, the surface has high levels of radiation (via Jupiter’s effect on the solar wind). Here's a picture of Europa, taken by a NASA probe. Here's a recent picture of Europa and some other moons, taken by NASA's Juno probe, on July 5, 2016. 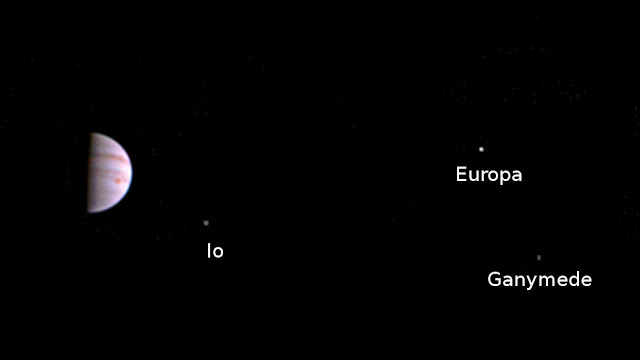 Granted, the moons are pretty small, but this is the first reasonably close-in picture from the new Juno probe. Hopefully, we will get some more interesting photos of Jupiter’s moons, though I believe the probe’s science mission is mostly focussed on Jupiter itself, the atmosphere in particular. Helena Puumala's SF Romance series features the planet Kordea, home to a race of beautiful and powerful psychic aliens, known as the Witches of Kordea. 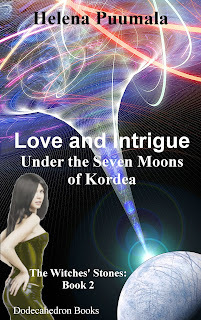 The planet has seven moons, an extraordinary arrangement for a terrestrial sized planet in its star's habitable zone.